Because Interior Design is an ever-evolving industry, it can sometimes feel overwhelming to keep up with what’s trending– especially since a beautiful design can be a long-term investment. However, there are some essentials to Interior Design that will never age themselves, remaining timeless and classic in your space. This home, designed by Kathy Banak, is the perfect example of how to achieve a quality, classic interior that will evolve with the ever-changing times of the design industry. 1. Window Treatments. One of the most influential and easiest ways to give your space a completed look is by adding window treatments. Choosing rich fabrics and quality craftsmanship is key- it truly will give your home the classic, quality look you’re going for. 2. Organic Natural Finishes. The first thing you see when looking at this beautiful kitchen is the richness in the quartz countertops. 3. Soft, Bright Color Palette. Choosing the right color palette for your home is key when designing your space. Since we reside in Washington which is gloomy most of the year, it is essential to select colors that feel bright and airy even during the darkest months. Rich, fresh upholstered details bring a sense of cohesiveness to this charming family room. 4. Accessorize All Of Your Spaces. It’s the little things that make a big difference. Does your hallway or foyer have an alcove perfect for a side table and some ambient lighting? It is these spaces that work perfectly to debut your favorite pieces. Are you looking to revamp your space and not sure where to start? Contact Kathy Banak at Authentic Home for a consulatation. With all of the muted colors trending, it is quite refreshing to see that Pantone’s 2019 Color of the year is Living Coral, a vibrant, saturated hue that truly makes a statement. With all of the gray interiors that have popped up in the past year, this gorgeous color truly stands out and can be used for both accents as well as primary color schemes. Coral Accentuated Dining Area. Through the use of coral window treatments and accents, this hue truly makes a difference to this otherwise very neutral dining room. 2. Bold Coral and Teal printed wallpaper. Because coral and blue hues are compliments of each other, they make a true statement, especially when applied in bold prints like shown in this powder room. 3. Simple Coral Accents. By implementing just a touch of coral into your interior, you can change the entire look of it. It brings a sense of warmth into a space, while being playful yest sophisticated. 4. Furniture Accents. What a cool way to accentuate a piece of otherwise plain furniture! This beautiful piece has been brought back to life with just a touch of coral paint detailing. 5. Coral and Green. Another color that is making a comeback in 2019 is Hunter Green. Paired with the Color of the Year, it can truly bring drama and refinement to your space. What are your thoughts on the Pantone Color of the Year? If you’re seeking Color Consultation, contact me at kathy@authentichome.com. Have a great 2019! Well, it’s that time of year already again! The sun is about to go into hibernation (at least in the Pacific Northwest, that is)! But, there are ways you can make your interior still feel luxurious even in the darker months with an unassuming color- blue. Here are ways in which you can implement blues into your interiors without feeling blue. Interior designers love working with colors that are trendy in order to create unique and stylish spaces that are beautiful. One of the most popular colors that designers are using right now is blue, so incorporating various shades of this hue into your home will bring a current vibe into it and psychologically impact qualities that are associated with blue. If you want to create a soothing environment that will stimulate your mind and improve your ability to think clearly, blue has been scientifically proven to put your mind at ease. Blue can be wither an intense color, or somewhat neutral when used throughout various spaces, so it is important to consider the size of your space before choosing blue as the main color. Mixing varying shades of blue is a gorgeous way to not only break up the monotony of a using one hue of blue, but also creates a more calming space. You can also use several patterns in your blue furniture, accents, and wallpaper so that you can provide enough contrast within a room while still keeping the blue color the focal point. 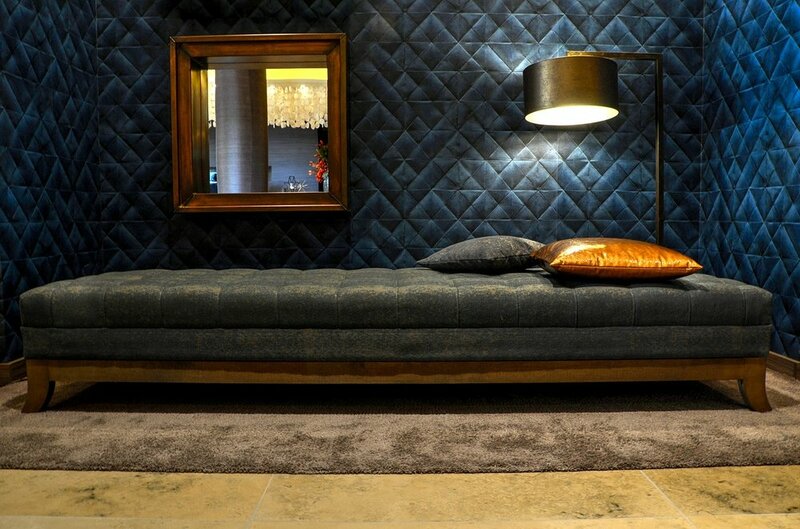 Darker shades of blue are certainly rich and sophisticated, but they need to be used correctly. Too much dark blue in a room can make it feel colder and smaller than it actually is. Gold, yellow, and other bright hues pair perfectly with darker blues, so add these too offset the cool tone with furniture, accessories, window treatments, lighting. This is how you can truly bring out a darker blue hue in a classic way. Also, if you are going to have darker blue walls, you may want to contrast them with light furniture or accessories. In the same way, if you have a lot of blue furniture in a room, try to add accessories that are paler or cream colored to break the darkness up while still maintaining the calming vibe. If you would like to go in a different direction, you can also use dark brown wood to ground blue colors throughout a space. Just think of the color wheel- the opposite of blue is orange (it’s complement). There tends to be a love-hate relationship with the color purple and it's sister hues. This is because it has been long associated with being considered a feminine color, unique only to girlish spaces. But we beg to differ. Purple can make an otherwise stark space feel big, bold, and even masculine! 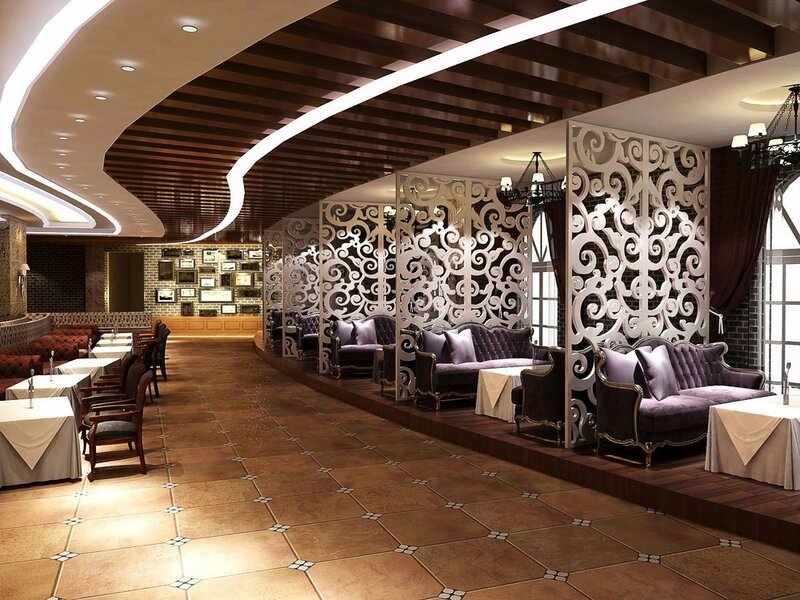 This gorgeous restaurant space is adorned with antique tufted sofas in place of booths. The purple upholstery gives it a more masculine feel in the way that the space is designed with industrial finishes, patterns and accessories. When purple is used in clean, contemporary rooms, it definitely exudes a more masculine vibe. The simple purple, velvet throw pillows on the bed still have a streamlined feel, suited for a king! In history, purple was a well-sought after color, as only royalty were able to get their hands on this pigment. You will often see purple adorning interiors from past times, as well as royalty dressed and accessorized in this color. 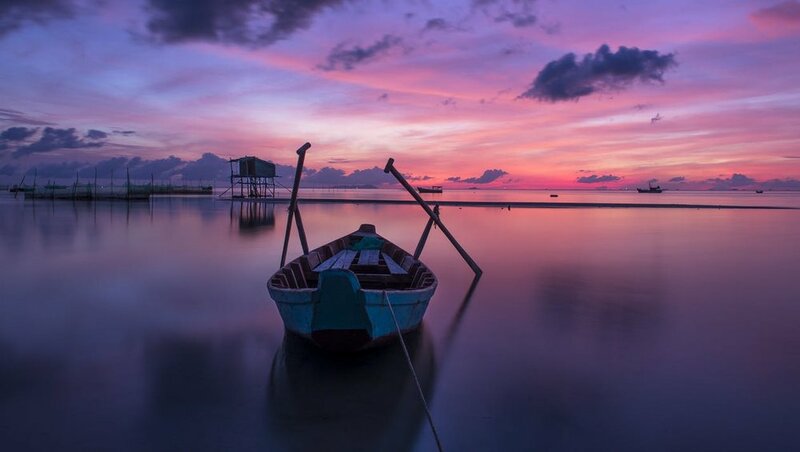 What is your relationship with the color purple? Most people either love it or highly dislike it-- either way; most people are unsure as to why or why not they would use this hue in their space. Well, it's been a long winter-- but we are on the cusp of Spring, I just feel it! It's that time of year when you want to freshen up your space- making it brighter, airier, and uncluttered. Which is why I thought it would be fun to share some gorgeous white interiors to inspire you! 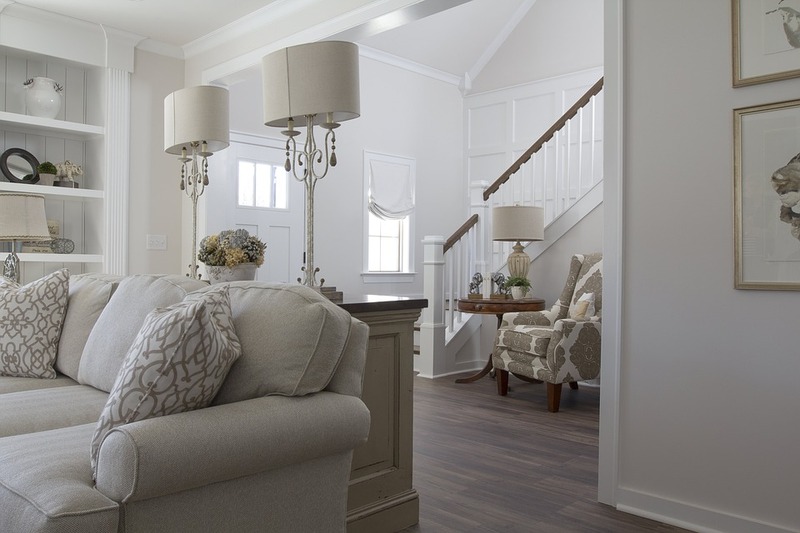 This beautiful neutral color palette features white in a classic, timeless manner. In the 90's, we were so afraid of white walls, but rest assured-- you can have a gorgeous space with a mostly white color palette that is as sophisticated as it gets! Implementing metallics and fresh plants is an easy way to pull together a white color palette. There is something so fresh and inviting when designing with this scheme. Another beautiful perk of a neutral color palette, is that is emphasizes the beautiful details of your home's architecture. 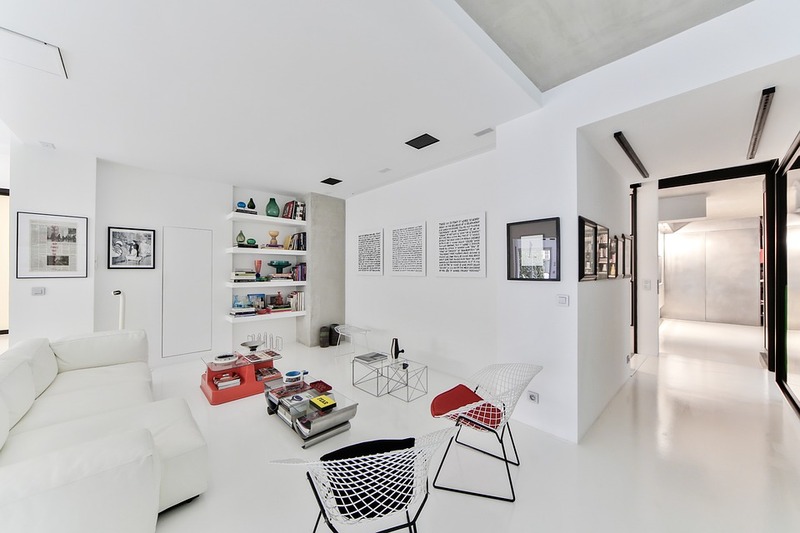 All white color palettes work in both traditional design as well as modern, contemporary design. There is something so clean about a white palette- a look that has never and will never go out of style! If you have a smaller space, a white color palette will make your space look larger. White reflects light, which gives your space an open, bright, airy feel. Rich and pensive, Ultra Violet is reminiscent of existential energy, the mystery of what the future holds, and the new discoveries of the past and present. It reminds us of the night sky, dark but endless, full of mystery. With everything happening in our world at the present moment, Pantone color researchers thought it necessary to remind ourselves of our sheer presence on earth and the vast endlessness of our atmosphere. Ultra Violet is cosmic, rich, and timeless. 1. Using rich purples make a bold statement as an accent. This gorgeous bedding truly brings forth a timeless, rich look to this elegant bedroom. Rich purples tend to pop when placed in an otherwise neutral color scheme. 2. Even the tiniest purple accents in a space can make a very bold statement. This otherwise very white bathroom stands out with just the pop of color of its hand towel. 3. Ultra Voilet in Commercial Design. There's no doubt the guests who visit this elegant restaurant will never forget the gorgeous, sophisticated upholstery on the dining chairs. What a statement! Reminiscent of the Victorian Era followed by the 1920's rich purples always manage to make a fashion comeback. We are seeing this beautiful hue in every aspect of the runway, from hair color to couture. The beauty of this otherwise considered feminine color is that it truly works for both genders and truly makes a haute statement! It's that time of year- when nesting begins; you start lighting candles and fires and curling up in plush blankets. It's the time of year when we want to snuggle up with a good book and celebrate being away from the elements. Here are some ways in which you can make your space more cozy during the colder months. 1. Candles and sparkle lighting. I always love to put white holiday lights on topiaries and drape them in otherwise darker places in my home. This gives your space a glow and sense of coziness. 2. Blankets and Soft Fabrics. Drape your furnishings with plush throws and pillows. This creates both a visual warmth as well as an acoustic one within your space. It's always nice to have something to curl up with when relaxing. Pale pinks were very popular in the past and tapered off up until recently. We are seeing beautiful rose colors, blushes and other feminine pink hues throughout the Interior Design world. Here are some of our favorite uses for blush tones. 1. Fabrics. Pale pink fabrics can truly bring elegance into a space. This beautiful blush Chesterfield sofa gives this room a sophisticated, classic look. 2. Decor. There are many ways in which you can incorporate this feminine hue into your décor. Through the use of fabrics or throw pillows, you can give your space an extra pop. Fresh flowers are always a beautiful touch too! 3. Paint. Beautiful pink hued walls bring a sense of warmth and classic feel to any space. This especially pink color creates a soft, welcoming, and elegant look. 4. Window Treatments. Pale pink window treatments can really complete a space. Incorporating beautiful florals and other patterns will give an otherwise basic room an extra focal point. Well, it's officially Fall! We are seeing that some trends that were making their debut last year are now going out of style, and new ones coming in. There are many design trends that we will see this year, starting in the fall and here they are. 1. Dark Paint. There is nothing richer or more classic than a saturated, darker color palette, specifically when applied to a wall color or furnishings. We are also seeing beautiful dark cabinetry, window treatments and decor that really make a statement! 2. Woven Textures. Wicker, wool, and other woven textures will give your space a warm, welcoming and organic appeal. Baskets and woven decor bring the outdoors in and create a rustic, traditional look. 3. Velvet. Velvet is a classic as it gets. The easiest way to incorporate this plush upholstery into your interior is through furnishings and window treatments. Velvet has been around for centuries and creates a timeless, sophisticated look. 4. Blush Color. Soft blush colors are being seen all over the design community and there's a reason why. Soft pinks have a calming effect and create a both feminine and elegant look for an interior space. 5. Brass. Brass is back! We are seeing it presented in more of a bronzed, brushed style as opposed to the shiny golden that was so popular in the 80's and 90's. It seems that this time around, designers have mastered how to incorporate this beautiful finish into their themes. What we're seeing a lot of for fall design trends consists of organic decor, eclectic old timey products, and vibrant color schemes. 2016's gray palettes are starting to fade away (no pun intended) as more saturated colors are being seen on the forefront. According to ELLE Decor, warmer color palettes are becoming very popular. Beautiful bright green and blue color schemes are making their comeback, and we're seeing boldly painted furnishings, wall colors and decor that really make a statement coming to fruition on the design front. One timeless way into which you can implement a timeless look is through collecting old novels and stacking them under your favorite decor pieces to create height and weight. A fun way to jump into fall trends is by implementing old fashioned pieces into your space. We love scouring antique stores and rummage sales to find the perfect piece for a focal point. This old wall sconce is a gorgeous piece that would look beautiful in any room in the home. Warmer colored metallic pieces are all the rage in the design world this year. Bronzes, brass and golds are being seen in both designer commercial and residential spaces. You can implement this look through the use of throw pillows, accessories, and lighting. There's nothing quite like having company over and receiving compliments on a unique decor item you have in your home. Owning a piece of handmade craftsmanship is like owning someone's true passion and skill. Being the only one in the world with their unique design has its specialness, too. It's all the rage at Highpoint this year to own live edge tables and other furnishings reminiscent of their prior organic state, and we can see why. These beautiful unique pieces are not only a conversation piece, they are elegant, timeless, and well, natural. Finding a local artisan who can design these beautiful products isn't always easy; you can however, find unique pieces that aren't custom made for your space all over online. Gotta thank technology! There are unique pieces like the ones pictured above that are both elegant and timeless and won't break the bank . You can find crafts like these at your local art fairs and farmers markets. Etsy is a great place to find unique artisan pieces as well. Living in the Pacific Northwest allows us to find pieces of artisan work reminiscent of our natural surroundings. Driftwood frames like the one pictured above are a beautiful beachy way to bring the outdoors in. 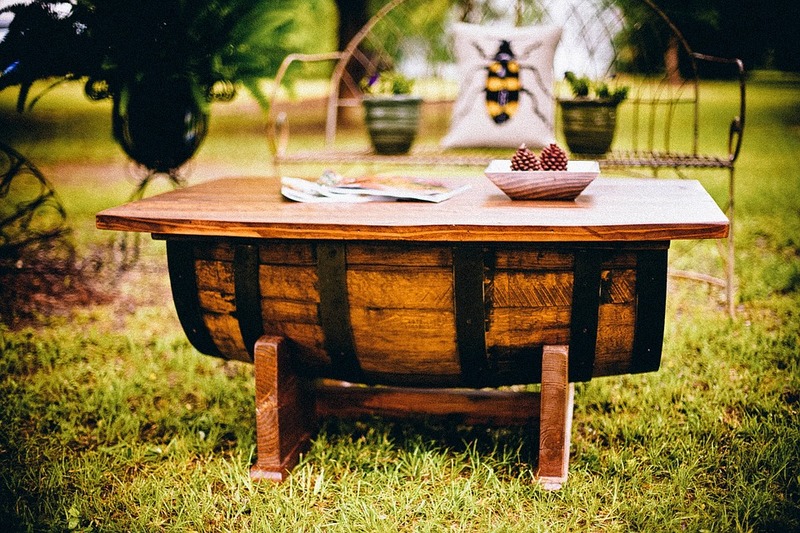 Having a unique piece of handmade craftsmanship is not only a special way to add a focal point to your space, it helps support your local craftsmen as well! Remember when brass was considered dated, old and 80's-90's? Well, this is no longer the case. We thought we would never see this shiny metallic make its comeback, we were wrong, and it's made its comeback stronger than ever! We're seeing it applied to all surfaces, large and small in some of the most elegant ways. Accessorizing with brass and gold colors truly makes an elegant statement against the current color palettes that are trending. While we remember seeing brass hardware against forest green and burgundy backdrops in the 90's, we are now seeing it paired in conjunction with beautiful blues, grays, and even orange hues. It's not just shiny, polished metallics we are seeing on the forefront. Rustic metals reminiscent of earlier years. Beautiful lighting fixtures, photo frames and accessories with aged finishes make for an elegant timeless look and will never date themselves as time progresses. Plumbing and cabinet hardware are definitely leaning towards the warmer metallic tones and we can see why. This gorgeous bathroom fixture truly makes a statement that is classic, sophisticated, and elegant. There is something about having fresh flowers within our space that makes us feel happy. Psychological studies have shown that having bright foliage within your space reduces stress and brings forth a sense of peace in our minds. Here are some simple flower arrangements that you can create for your space! Light green and peach hues adorn this arrangement giving the perfect, beautiful cohesiveness to it. In floral arrangements, we are seeing a theme of less is more. There is something so timeless and elegant about a simple stemmed flower in a tiny vase. Bring in freshness and cheer with this classic look. A gorgeous mason jar mug gives it a shabby chic appeal. Give off the look of clipping in the garden with an old bucket and just a couple of flowers. So simple, yet so chic. Hydrangeas for forever be seen as one of the most classic flowers in design. There is something so timeless about their appeal and they dry beautifully! Vibrant blues and warm colors are what's trending in the design world, according to ELLE Decor and we can see why. The more saturated a paint color is with white trim or details, the more it seems to pop and the more intense of a focal point it creates. As you can see in the above interior, a vibrant complementary color scheme really makes a statement that is both elegant, sophisticated and timeless. We're seeing brass and gold as accessories make their return to the design front, and they pair beautifully with the color schemes that are trending. Warmer color palettes consisting of reds, browns and oranges are making their comeback as well. While the common gray interior is still very popular, we are seeing the design world take a turn into warmer schematics and colors. Vibrant blues and greens reminiscent of color palettes in the 1930s are debuting on the design front. Peacock color schemes are trending and make a gorgeous statement in all types of interiors. Teal has been making its way through the Interior Design community for many years, but it seems to be debuting especially during the warmer months! There is a reason this gorgeous hue is so popular in Interior Design, and here are some of our favorite interiors featuring it. There is nothing more elegant than gorgeous teal tiles adorning a copper clawfoot tub! This gorgeous color combination has been making its debut across the design world and it sure to be seen more as time goes on! We can see why. Beautiful tropical style wallpaper, throw pillows and small teal accents truly bring together this otherwise neutral space. By staying within the tertiary side of the color wheel, teal and green make for a beautiful, rustic kitchen focal point. There are many ways in which you can bring the sunny brightness of summer into your interior. We are now seeing white as a common color theme in design, and the reason for this is because white is as clean a palette as it gets and it can make your space feel larger! 1. Color. One of the easiest ways in which to make your home feel light and airy is through the use of color. As mentioned, white has made a comeback in the Interior Design world, but punches of teal and burnt orange are a beautiful way to give off a summertime vibe within your space. 2. Natural Textures. Wicker and tweed are reminiscent of tropical places, so by implementing them into your interior, you are bringing an organic, fresh touch into your space, giving a beachy feel. 3. Artwork. Beautiful colorful artwork is a gorgeous way in which to make your interior pop with a summertime feel. Gorgeous organic prints and patterns will give your space that extra fresh look. 4. Foliage. It's the time of year when beautiful fresh flowers are plentiful right in our yards! Pull out those clippers and bring a little bit of that freshness in! The brighter the color, the more summery your space will feel! Medina Manor Gets An Entire Refresh! The color of something really never registers to us far beyond the fact we recognize the color, at least not on a surface level. Did you know subconsciously the colors you are exposed to on a daily basis play an important role in your mood and emotions? There are certain colors that are said to invoke certain moods or make you feel certain ways. 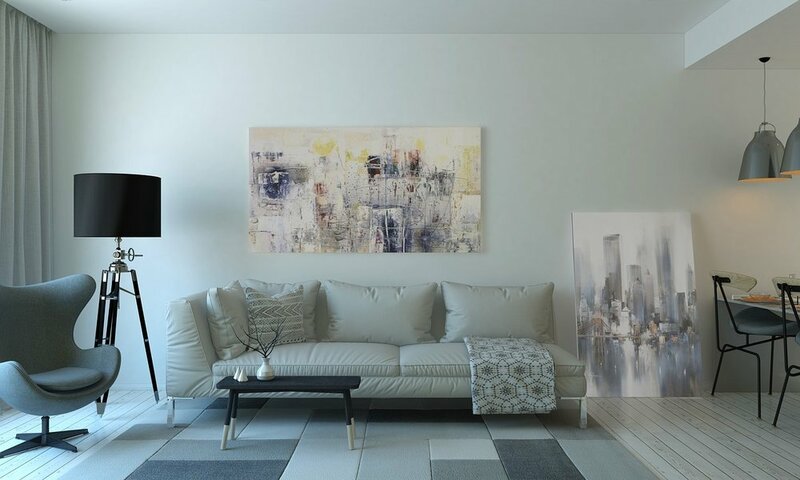 You wouldn’t believe how powerful color can be, which is why when you are considering painting your home’s interior you want colors that will promote happiness, calmness, and comfort. So, then now that we understand the role colors play in our moods let’s take a look at some colors that could benefit you when you use them. Now, let’s take a look at a few examples of which colors would be best where in your home. As with anything you have the choice to pain your home however you like, please simply know this can be used as a guide. The color Green at times can signify money or finances which is why the color itself helps you become more productive. Green also produces the least amount of eyestrain which makes this color a wonderful choice for a computer desk. Give your eyes a break from the computer screen ever so often and gaze upon the lovely green shade of your desk. The work out room could benefit you more if it was painted orange. Orange is said to help increase stimulation as well as enthusiasm. Orange is also said to help increase oxygen supply to the brain and stimulate the brain activity. If you can’t paint a whole room orange then try opting for orange work out attire instead. Avoid overusing the color grey if you can or if you prefer grey, pair it with a more upbeat color because grey by itself can inspire people to be more passive, have a lack of energy and become uninvolved, but if you pair it with a bolder, brighter more upbeat color you can counteract the psychological effects make a gorgeous statement! Colors may seem like such a small aspect when you are thinking about your home and how aspects of your home effect you but truth be told color is one of the largest influences on us and when we spent so much time in our home don’t we owe it to ourselves to used colors that will promote health and happiness rather than dulling and sad colors?